“Man, who is the only creature on earth which God willed for itself, cannot fully find himself except through a sincere gift of himself” (Gaudium et Spes 24). “Whosoever shall seek to save his life shall lose it; and whosoever shall lose his life shall preserve it” (Luke 17:33). The Bible tells us little about St. Joseph, but what it does tell us is a magnificent example of this principle. Joseph was betrothed to Mary. The Jewish betrothal ceremony had more weight than our engagement; they were effectively married, just awaiting the moving-in ceremony. Yet when he found her “with child through the Holy Spirit,” Joseph decided to send her away. (Our imprecise modern translations say, “divorce,” but the Greek is more like, “set her loose.”) The first thing we can see is that the coming of Jesus confused Joseph’s plans. Reading quickly, we sometimes mistake Joseph’s motives – and in the process, we mistake the strength of their relationship. Perhaps he thought Mary had been with another man. But surely no one who knew Mary would think that. Rather, it says that he found her with child through the Holy Spirit. The text allows us – and the context compels us – to think he knew the child was divine. He sent her away not because he thought she was bad, but because he thought she was too good for him. It says he wanted to send her away because he was righteous; like any righteous Jew, he did not dare step into the sanctuary, knowing he was unworthy to see the face of God. Indeed, the scandal of Mary is that God has come far too close. It doesn’t seem appropriate. It doesn’t seem possible. So we pretend that Jesus is either less than God or less than truly human. To recognize that Mary is truly the mother of God is to explode our minds. Joseph, being holy, didn’t deny the truth – but he stepped away from it. Thus the angel has to say, “Joseph, son of David, do not be afraid to take Mary your wife into your home.” (And we must be told, as well, not to be afraid to welcome Mary into our homes.) Joseph is afraid – but the angel reminds him of his own messianic dignity. The angel tells Joseph of the role he must play: “You are to name him Jesus, because he will save his people from their sins.” Joseph is the namer. He did not conceive the child, but he is to act as the father. And he is to name Jesus savior – not destroyer. On the one hand, Jesus seems to upend Joseph’s plans. Like Abraham, Joseph must set off on a trajectory he never expected. But in losing his life, Joseph rediscovers it. Naming Jesus points to how personal Joseph’s vocation will be. Children need parents – not just institutions – because they need to be known personally, to be known by name (not just by number). Joseph’s fatherly role is beautifully outlined in the naming of Jesus. And Joseph is to be husband of Mary. We have a strange idea of ancient marriage, as if they didn’t even know their spouses. But though sin has always gotten in the way, marriage has always been about love and relationship. Children need marriage because they need to experience those personal relationships, to grow up in a context of inter-personal love. The Bible portrays the first marriage, the marriage of Adam and Eve, as a delight, a discovery of another self and an end to the loneliness of being surrounded by mere animals. The Old Testament portrays marriage as the ultimate image of the love of God for his people, a love which is the opposite of betrayal and infidelity. I agree with the tradition that says the Song of Songs is about God and his people, not about human marriage – but regardless, it portrays marriage as profound being-in-love. And when Jesus gives the grace to restore marriage – a grace given preeminently to his mother – it results in a love like his own. The only commandment to the Bride is to love. Joseph wasn’t ignorant of Mary. She wasn’t some stranger that he suspected of adultery. She was his best friend. In the story of the Finding in the Temple, Mary can speak for Joseph’s heart: “your father and I have looked for you, greatly distressed” (Luke 2:48). Jesus is savior. He comes to restore, not to destroy. He calls Joseph, yes, to give up his life. Like any marriage, he must give himself unreservedly to his wife, to his child, and to God. In this marriage, he will have to give himself even more radically, as evidenced in his fear to go forward. But the angel tells him not to be afraid. In giving his life, he finds it again, in laying it down he rediscovers all the riches of love: the love of husband and wife, the love of father and son, the love of friendship, the love of God. 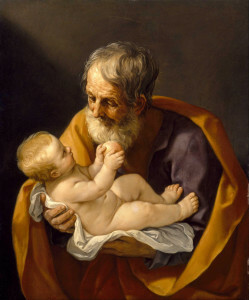 Where is St. Joseph in your devotional life?